MONDAY at APHA: Join us for the SOPHIA Social! Don't miss the SOPHIA Monday Social! Join fellow SOPHIA members and others for a casual gathering Monday evening, November 12th anytime between 6:30 – 8:00 p.m. at Basic. This is an informal happy hour that can be used as an opportunity to grab a drink with other SOPHIA members, colleagues, classmates, or old friends while you’re in town for APHA. Everyone will pay their own way. So we have a rough idea of how many people will be joining us, please email SOPHIA member Emily Bever if you are interested in attending. Come and go between 6:30-8:00 p.m. The Council on Environmental Quality (CEQ) issued an Advanced Notice of Proposed Rulemaking on the National Environmental Policy Act (NEPA) in June, and recently extended the deadline for public comments to August 20th. NEPA requires an environmental review of major federal actions that may significantly affect the human environment, such as building developments, waste removal, energy, mining, and roadway development projects. These actions can have substantial impacts on public health, but health is often overlooked or considered from a narrow perspective during environmental review processes. CEQ is seeking input on 20 questions about the NEPA process, the scope of NEPA review, and other items. This is an opportunity for public health practitioners and advocates to act to protect the components of the regulations that require consideration of human health effects and to suggest ways to strengthen the regulations. This will not be the only opportunity to take action: Even if you are unable to submit public comments by August 20th, we wanted to make sure our members are aware of this Advanced Notice so that you and your organizations can be poised to submit public comments when the proposed rule is issued. Please help us in welcoming two new and six returning members to the SOPHIA Steering Committee this term! It is important that such a talented force of HIA practitioners continues to commit their time and expertise to SOPHIA. This support from the Steering Committee and the ongoing commitment from our members are what make SOPHIA successful. Thank you! Current 2017-2019 Term Members-at-Large include Jimmy Dills, Fiona Haigh, Erin Marziale, and Kerry Wyss. We are also thankful for Tatiana Lin, Past President, who continues to provide support and guidance. A more formal introduction to our two new members will be shared in the coming weeks on the website and through communications. As we look forward to an exciting new term, we acknowledge and appreciate the work done by those completing their time serving within SOPHIA leadership. A big thanks to Lindsey Realmuto, Susan Sutherland, Steve White for their leadership over the years. Please note: In lieu of a member-wide vote (required when there are more candidates than positions available), the Steering Committee approved the candidates unanimously in July. There is no single approach for engaging the diverse community groups, decision makers, and practitioners whose participation is key to successful HIA. The following videos, put together by the SOPHIA’s Stakeholder Engagement Working Group, demonstrate creative and practical techniques to engage community members, decision makers and other practitioners as part of the HIA process. By sharing these stories, the working group aims to honor the oral tradition of storytelling and support the HIA values of democracy and equity. Read more about these HIA stories and explore all four videos. The Chronicles of Health Impact Assessment (CHIA) published Volume 3, Issue 1 in June 2018. "The articles contained in this issue highlight diverse aspects of HIA practice, including how HIAs can be used to demonstrate the interconnected nature of social, environmental, and economic effects from decisions; the role of legislators in exploring policies to support the use of HIA; and how the field can equip students to do community-engaged HIA practice." Access Volume 3, Issue 1 in its entirety for free! CHIA is an open access online journal which strives to give expression to health impact assessment research and scholarship to serve public health and planning professionals. 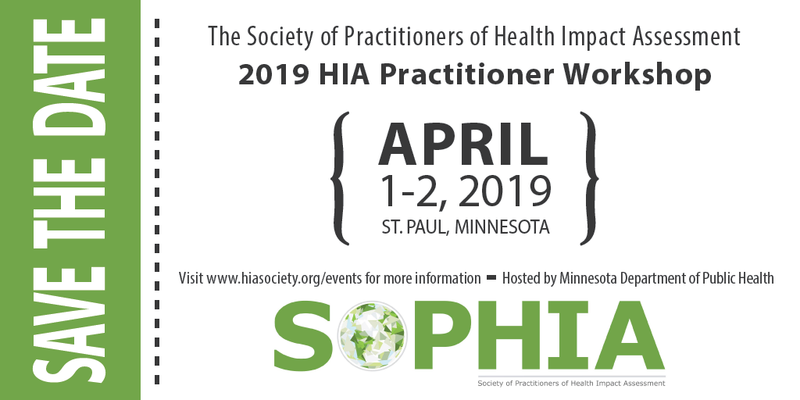 Please save the date for the 2019 Health Impact Assessment Practitioner Workshop to be held in St. Paul, Minnesota and hosted by Minnesota Department of Public Health. This 2-day workshop is a great opportunity to gather and learn alongside a diverse group of HIA practitioners. Don't miss it! Formal invitations and more details to follow. Please watch this space for updates. Registration will open in the fall. Read about the 2017 HIA Practitioner Workshop. SOPHIA and NNPHI Twitter Chat! 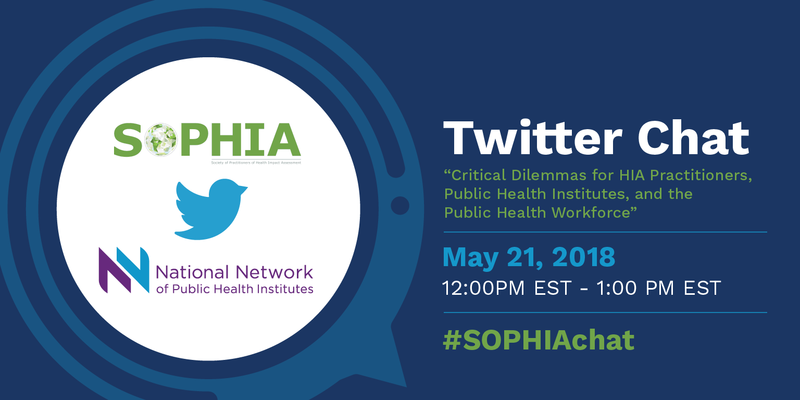 SOPHIA and the National Network of Public Health Institutes (NNPHI) are partnering to host a Twitter Chat NEXT WEEK! Join us as we discuss “Critical dilemmas for HIA practitioners, Public Health Institutes, and the Public Health Workforce.” We want to hear about your best practices and innovations as we explore trending topics in public health. What is a Twitter Chat? Your hosts (SOPHIA and NNPHI) will provide you with a platform to participate in discussion with your fellow practitioners through a series of questions over an hour-long period. Participants can engage by tweeting replies to questions or comments from other participants - and you don't even have to leave your desk! A handy guide is available that details how to join and participate. The chat will be 12-1pm EST Monday May 21. Participate by following SOPHIA on Twitter and the Twitter Chat hashtag #SOPHIAchat. We hope you will join us for this lively discussion in 280 character vignettes! UNSW is organising a free HIA and local government seminar at Flat Floor Theatre, UNSW CBD Campus, 1 O’Connell St, Sydney on Tuesday 22/05/18 from 10.00 am to 12 noon (Monday, 21 May 8pm Eastern/ 5pm Pacific for our US members). http://www.hospitality.unsw.edu.au/livestream on 22 May at 10am, Sydney time. No online registration is needed. HIA 101 Training Coming Up in June! Don't miss this HIA 101 coming up in June! SOPHIA is partnering with NEHA to present an HIA 101 Class as a pre-conference session at NEHA’s Annual Educational Conference in Anaheim, CA on June 24 from 10-5 PT. Jimmy Dills of the Georgia Health Policy Center and SOPHIA will lead this one day hands-on course that will give you the knowledge and background to consider HIA as a part of your EH practice. The cost for NEHA members is $100 and $150 for non-members. Register here. Did you see our Spring SOPHIA Newsletter? You can read all the latest here.